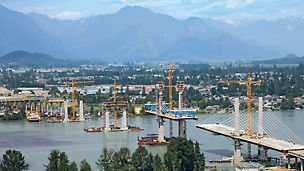 In this process, the falsework is moved to a new concreting position along with the formwork. Contrary to the cantilever launching method (compare page 24 ff), the concreted component remains in its position. Depending on the shape of the structure, an upper or a lower mobile support is used. The advantages of the upper system are high capacity on curves and free selection of the bridge cross-section. Moreover, the railway loading gauge under the new structure is not affected normally. The variant with the lower mobile support is advantageous due to lower cost implications. 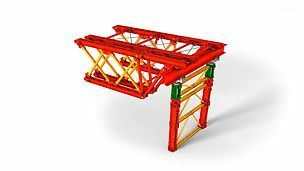 Furthermore, pre-assembled reinforcing elements can be brought in with the crane (time advantage) and suspensions through the structure are not required. 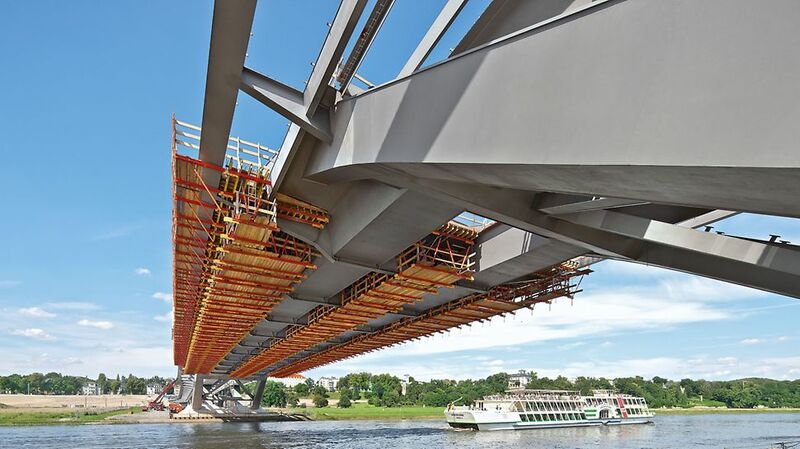 As a rule, bridge structures that are constructed with the help of mobile falseworks are designed as box girder cross-sections. 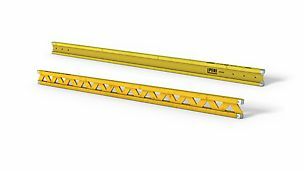 In exceptional cases, even T-beam cross-sections are used. 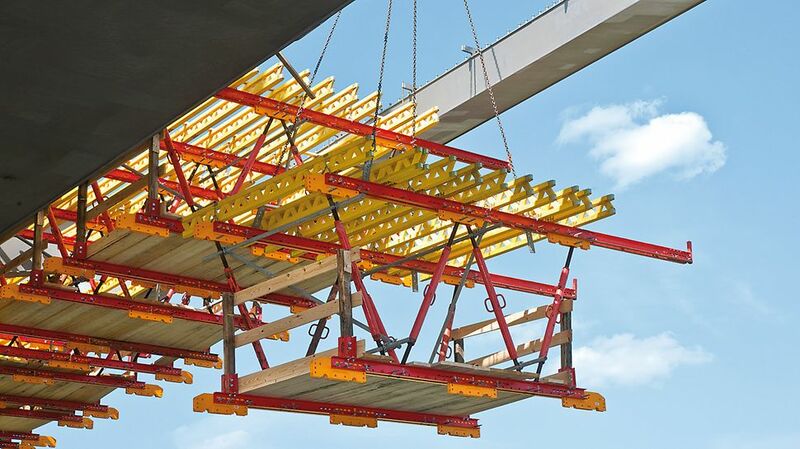 In the case of mobile falseworks, the formwork is constructed from standard components of the girder wall formwork. 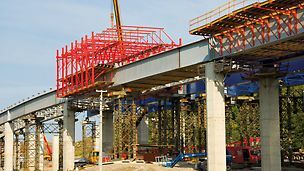 Steel beams with special connections and joints are mainly used for mobile support. 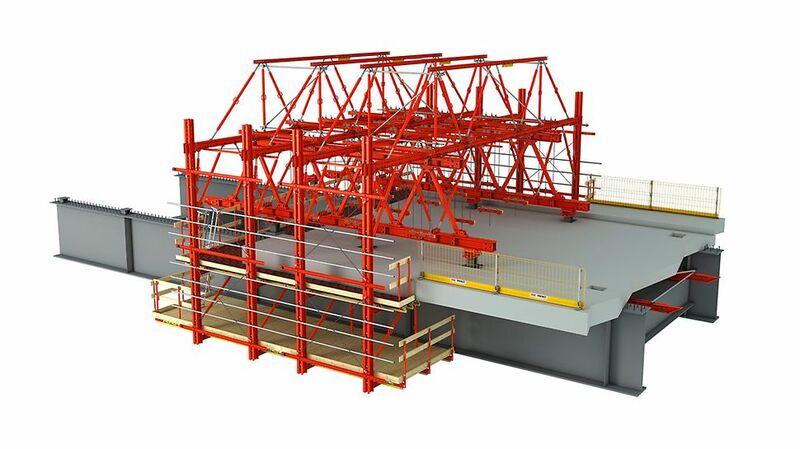 While planning, it must be ensured that the formwork and scaffolding systems are well coordinated since there is a close interaction between both systems. 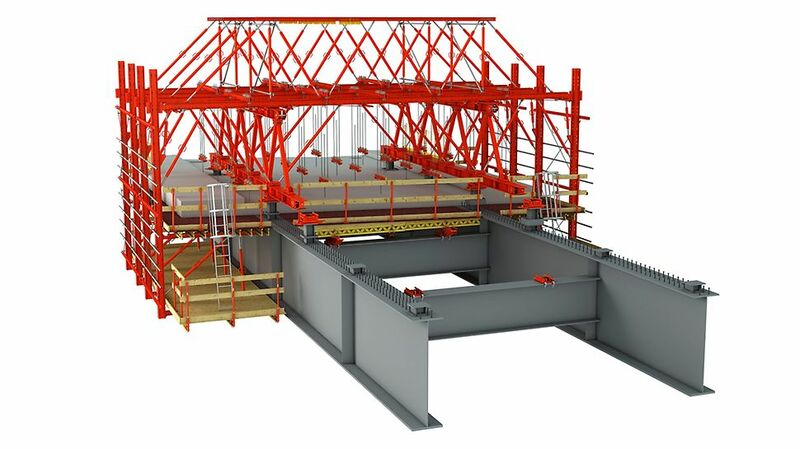 The basis of the formwork carriage consists of a longitudinal truss, comprised of the main beams from the HD 200 system. The length can, therefore, be adjusted modularly. 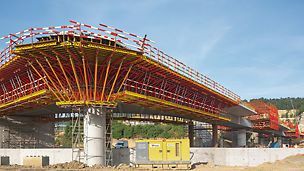 The lateral formwork unit is assembled completely from VARIOKIT material, through which an ideal adaptation to the dimensions of the structure is possible. Due to the VARIOKIT system, the area of influence of the lateral formwork unit can be freely selected. As a result, the material can be utilised to full capacity, which results in very cost-effective solutions. The wagon is moved on heavy-duty rollers that are attached to chairs on the steel structure. As the heavy-duty rollers are steerable, they can also be passed through narrow radii without any problems. Using standard VARIOKIT material, the brackets can be assembled according to the geometry of the structure. True to the principle of VARIOKIT, the components can also be used to full capacity through the choice of the area of influence, with the aim of producing the most cost-effective solution. Parėmimo sistema gebanti perimti dideles apkrovas formuojant didelius tarpatramius. GT24 ir VT20 puikus pasirinkimas kiekvienai situacijai pagal poreikį.